The central government, under the leadership of PM Modi has taken several initiatives to create a stronger foundation for the development of the society. 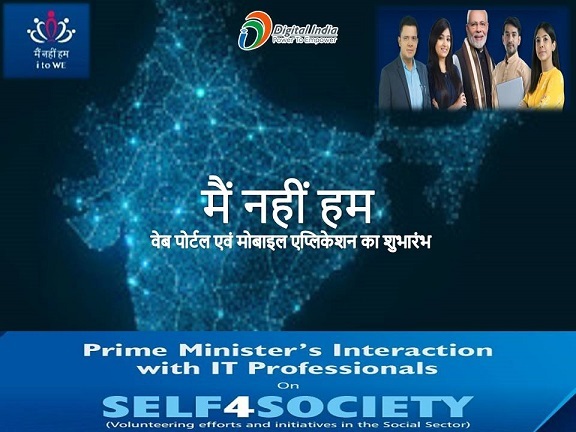 With the launch of “Main Nahi Hum” or “Self For Society” portal and mobile application, he wants to include all IT professionals in India in the task of nation building. Both the app and the site will help interested IT professionals to get join hands and work towards the betterment of the entire society. Development of the society – The main objectives of both the portal and the app are to pave the path for betterment of the society. These digital platforms will enable IT professionals to come together and create task plans to carry out developmental activities. Carrying out company’s social responsibilities – All big companies must work to contribute towards the progress of the society. The IT professionals, working in these IT companies, can discharge their social responsibilities with these digital platforms. Creating groups – IT professionals will be able to create groups, and add other like-minded employees, who desire to take active part in the developmental activities. They can discuss about their plan of action on these groups. Highlighting necessary tasks – The groups will help the IT professionals to inform others about the project at hand. People can offer their inputs to carry out the task smoothly. Only cooperation from different people can bring about holistic development. Spreading digital literacy – IT professionals have information about the working of apps and portals. It will be their responsibility to help uneducated people register and use these platforms. IT professionals will impart digital education to individuals who don’t have access to necessary resources. Online payment of bills – Both the portal and the apps will come in handy to pay online bills. As poor and uneducated people don’t have adequate digital knowledge, the IT professionals will come to their rescue. Attain information via portal or app – Apart from bill payment, people will be able to log on to the site or the application to attain necessary information about government schemes. The IT professionals will teach interested candidates how to operate these platforms to acquire details. The PM has only launched the “Self For Society” portal and mobile application. These are not yet active. As the entire project revolves around IT professionals, the central government will launch an authorized site. This site will allow likeminded people to pool in their resources, and help others. The application will be available on the Google PlayStore soon. It will be a free mobile application. The installation process is similar to other apps. We will offer detailed information about the website and the app once these are activated. Nation building and societal progress are rather difficult tasks, and require the coordination of people from all sections. Individuals who have access to the means must step forward to help those without resources. With the launch of this new portal and application, the central government wants to ensure that IT professionals can pool in their resources, and boost the societal development.